Youtube: Foley Square in detail! Just in time for Christmas, our third big Manhattan module has been released! The Foley Square and its surrounding skyscrapers was rebuilt out of 1214 bricks. 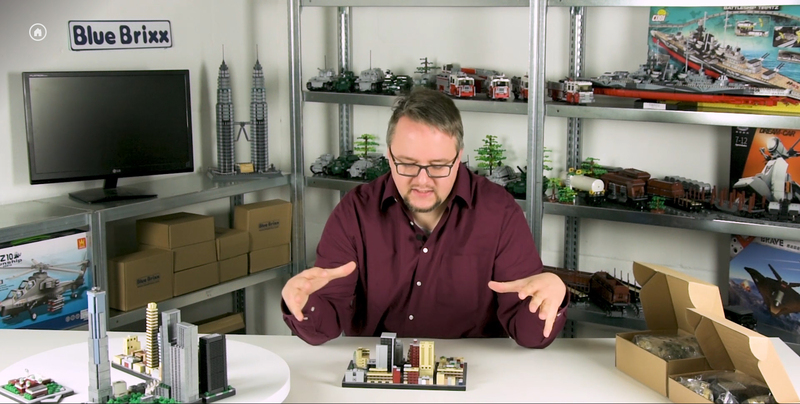 In the current video, Marco presents the module in detail and tells which striking buildings and squares you can discover. For example, did you know that in New York City there is a 170-meter-high house without windows? New Manhattan module: World Trade Center is available! 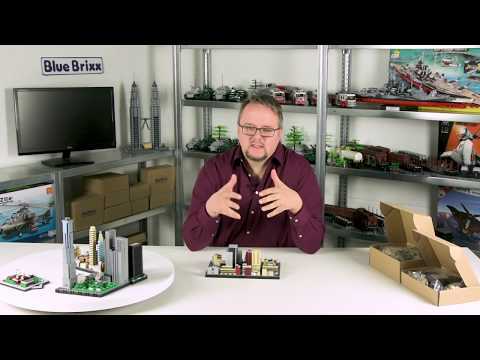 Last week we extensively presented you the World Trade Center on Youtube, now the set is available! 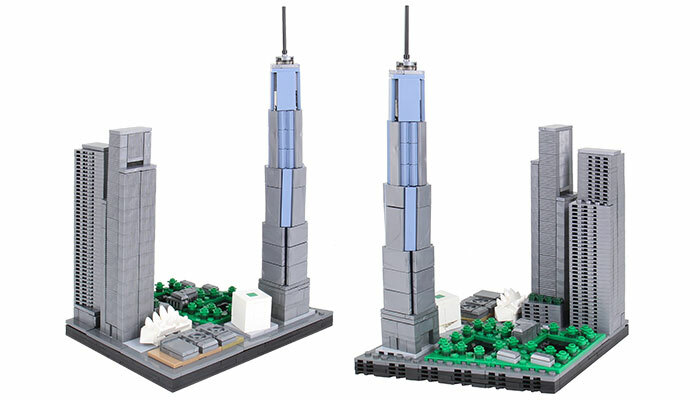 With 683 bricks the module currently presents the tallest building in the US. On a scale of approximately 1: 2000, the spire of the One World Trade Center reaches a height of 27 cm, which corresponds to 541 meters in the original. Impressive, isn't it? The module connects to one side of the City Hall module. Together, the two sets already form a distinctive part of the New York skyline. This time, Marco reveals what is currently being worked on in the product development department. For the first time, he presents some prototypes that are currently on his desk and on his shelves. If you want to be surprised, you should not look at this sneak peek: spoiler alert! The next modules of our huge Manhattan construction project are in production, the first module "City Hall" is back on stock! Ellis Island is located in the New York harbor west of Lower Manhattan and was now also built out of bricks. At the beginning of the 20th century, the island was the head office of the immigration office of New York. More than 12 million immigrants arrived in the US via this island until the island was decommissioned in 1956. Our small model of about 260 parts shows the larger northern part of the island with the main building, which is now used as a museum. Since the island is located in the harbor area on the west bank of the Hudson River, it does not fit directly to one of the 17 other Manhattan modules. But the scale is the same, and from Lower Manhattan there are many daily ferries to Ellis Island. In later modules such ferries will be built from bricks and be on the Manhattan's moorings! 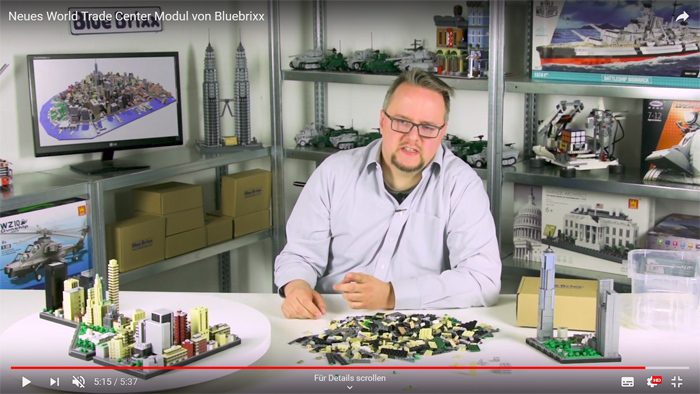 In our second Youtube video, our product developer Marco shows you the first modules of our huge Manhattan construction project. Together, the three modules already contain over 3,000 bricks, in total there will be more than 20.000 parts in 17 modules! He takes a closer look at the second module and explains which interessting sights there are to be discovered in shape of bricks. In addition to that, he reveals the way he approaches the construction of such huge sets. Instead of digging in a large mountain of parts, he first sorts everything according to colors and shapes. This has something meditative for him and he quickly finds all the parts when building. And how do you build? Comment on Youtube how you handle larger construction projects. Don't worry: there is no right nor wrong when building, the main thing is having fun! Bricks are clingy. Not only do they cling well to our feet when we step on them barefoot, but above all they cling to each other. That's why you can build high with them without everything collapsing. This is made possible by the knob, which sits on most bricks on top and can be stuck into the underside of almost all other bricks. Advanced builders and more sophisticated sets of bricks use not only the classic stacking of bricks but another technique which is called "SNOT - stud not on top". 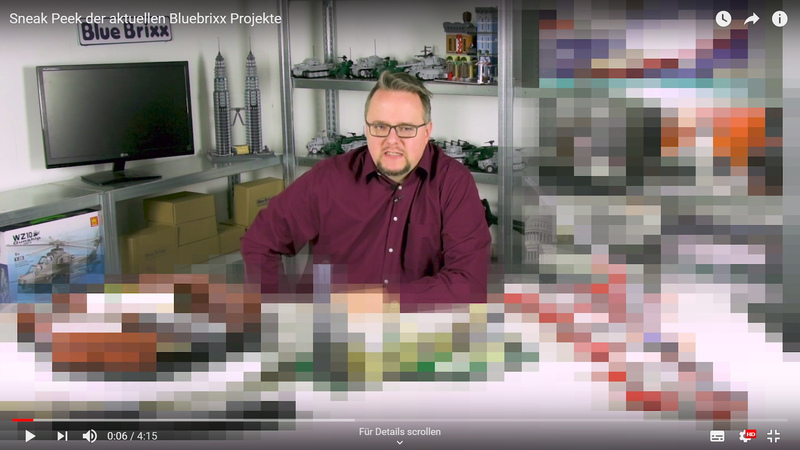 If you have already built one of our Bluebrixx Specials, you have certainly got to know this construction technique. There are a lot of special parts, which cause a change in direction of the knobs by 90°. Without this technique, our realistic models would not be possible, whether it's the skyskrapers of Manhattan or a tank turret. 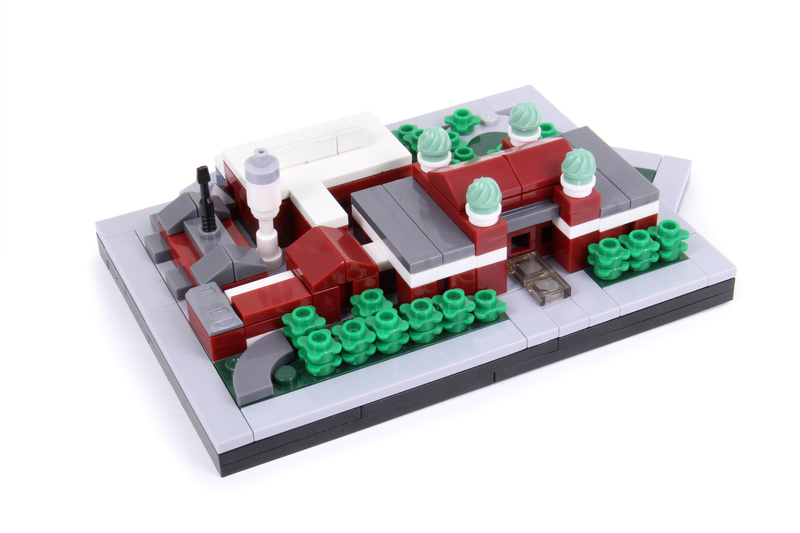 SNOT is indispensable for modern brick sets like Bluebrixx. Lower Manhattan continues to grow rapidly! We've just showed you the first pics of the World Trade Center module now the next module arrives: The Foley Square. Here are some important government buildings. The beige skyscraper with the large vents is the AT & T Long Lines Building. It does not have a single window and is considered one of the safest skyscrapers in America. It has it's own gas and water supplies, even an own power generation - a real architectural icon. The third module and the second take City Hall into their midst. Right next to the eponymous park Foley Square stands the famous Supreme Court, whose module will soon be produced. If our Manhattan grows much further, we need a bigger photo box here at Bluebrixx! 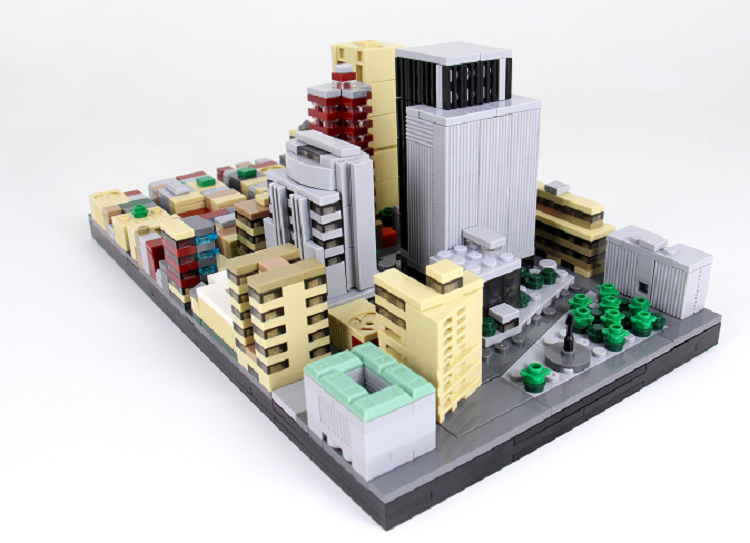 The next module for our big Manhattan model is very eagerly awaited by many of you. 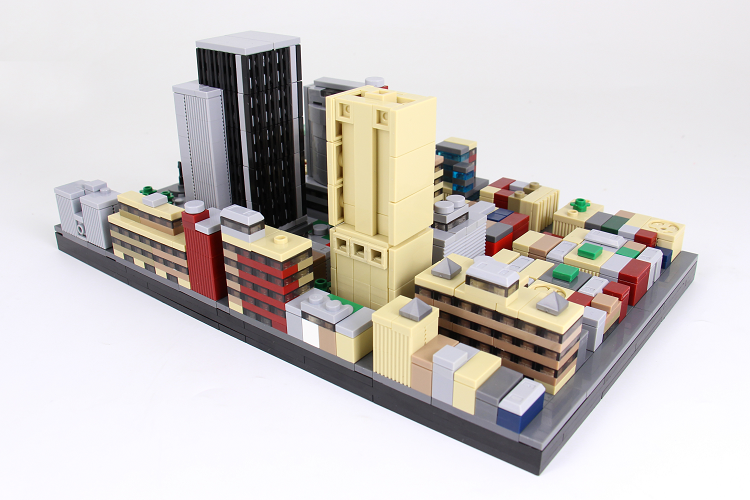 Today we can finally show you the first copy of the World Trade Center module. It is currently in production and after that it only needs to be shipped to Germany. So, you can be sure that it could be waiting for you under the Christmas tree later this year. Really cool are the stones and tiles in a steel-metallic color. In this way, the modern Architecture of this famous buildings come ito its own. Check out the pictures, just to quicken your appetite. In 2017 we came up with the idea of creating a huge model of Downtown Manhattan at a size of 3ft by 3ft and made of bricks. Adrian, who is a very experienced designer and who has also developed some great tank models for BlueBrixx, was enthusiastic about this idea. So we went ahead with the project and several months later we could see the result: an unbelievable and outstanding model, made from more than 20,000 parts. So this first step of completing the initial design had been solved by Adrian with a fantastic result. But to organize 20,000 parts per model costs a lot of money and is also a huge risk. Who knows if there will be enough interested customers willing to spend their money on a model like this? Firstly, we divided the whole 20,000-part model into 17 smaller units. In this way we could proceed step by step, reducing the cost for you, our customer, and also reducing our investment in developing the very first model. Secondly, we decided to present this project on Kickstarter, where we have the great opportunity to get your feedback. This will give us confidence in our decision on whether to invest further. Of course, if we find enough backers for the City Hall Unit then we will continue with all the other 16 units. We are planning to finish another new unit for delivery every four weeks. Only in the case of the second unit do we expect to need a little more time. For the first unit ‘City Hall’ we have already finished the instructions and prototype model. The very difficult issue of sourcing all the bricks we need has been solved. 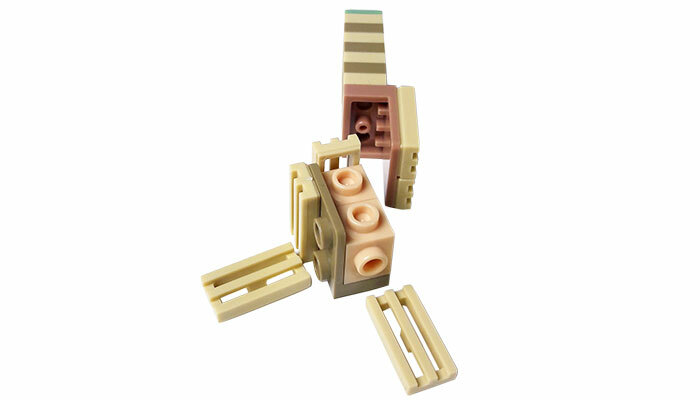 To keep the price within an acceptably low range, we have chosen not to use Lego® bricks. 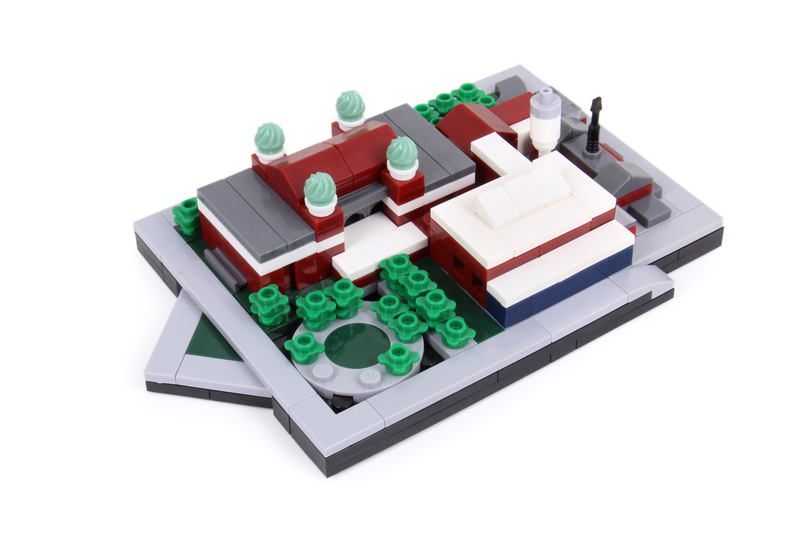 The quantities that can be ordered through the Lego® Shop are very limited, so that was not a viable solution for us. Instead, we are using bricks from other manufacturers who can provide us with the quantities we need. The shape, color, and quality is almost identical. Of course they do not have the Lego® logo on the studs, because it isn’t Lego. 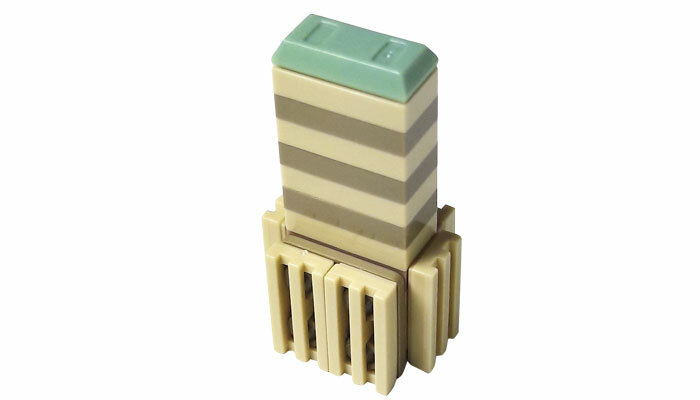 From the customers of our tank models we are receiving feedback all the time, and they tell us our bricks work well in conjunction with Lego® parts. We agree with their estimation. As an additional reward for your support we offer the Ellis Island Unit. This design is also completed and you will receive it together with the City Hall unit if you become one of our first backers. 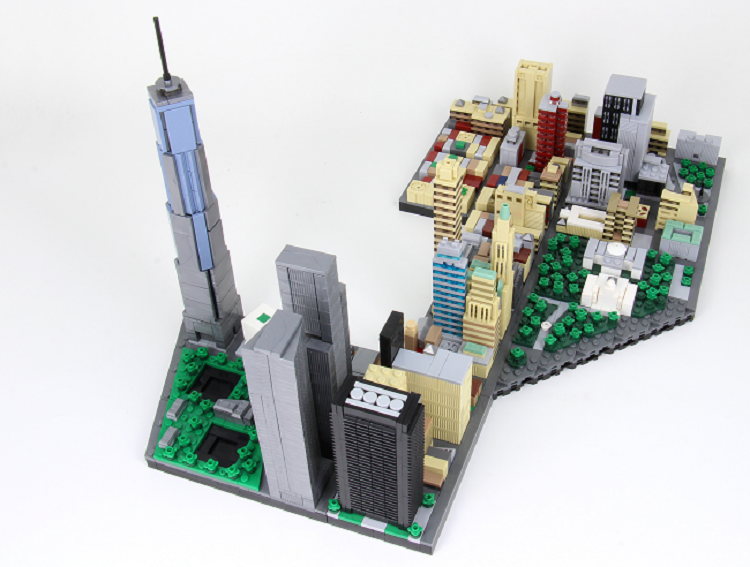 We have put a lot of effort into the design of the Downtown Manhattan model. We need your support for the very first City Hall unit, to make the dream of the whole block based model a reality. In terms of pure parts count, this is my largest creation to date, totaling over 20,600 parts and measuring 135x129 studs (107x102cm). The project began with a request from BlueBrixx to model Downtown Manhattan and after clarifying that they understood the scope of what this would involve, the first step was to solve the geometry for the base in a way that would allow the full build to be split across 17 units while still respecting the angles required for the main roads and blocks of buildings. After that, the actual designing of each unit was mostly straightforward, though also very demanding in terms of accuracy and detail. A lot of time was spent using Google Maps, switching between Street and 3D views as I progressed street-by-street and building-by-building through the city. The height of every skyscraper was also meticulously calculated for scale. A further challenge was posed by the many angled ‘off-grid’ sections of roads and blocks of buildings, which was met through the use of trigonometry to calculate the necessary connection points for connecting on-grid and off-grid sections within the tolerances of the parts. 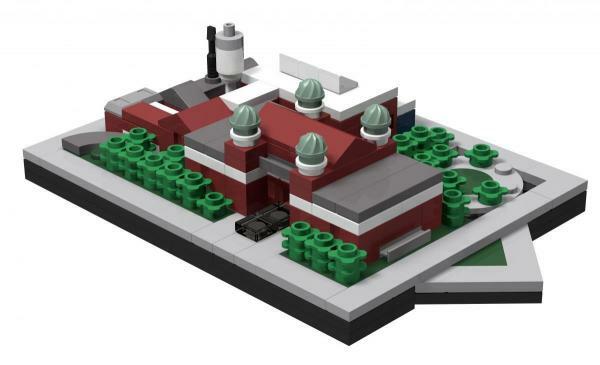 While the design was created in a digital format (using LDraw and LPub software), most of the complex buildings and structures were also test-built in physical bricks, as many buildings required complex geometrical solutions and tricky connections which were more efficiently solved through hands-on building. One further challenge was that of deciding how to deal with the ongoing construction present throughout the city. For instance, I have included the completed Performing Arts Center (next to 1WTC) while the adjacent 2WTC area remains a construction site. While the many large and iconic skyscrapers – such as the One World Trade Center, One Liberty Plaza, and 60 Wall Street (Deutsche Bank) – might be the most eye-catching in the final model, the more satisfying parts of the design process were the coastal areas and many finer details, such as the South Street Seaport (Pier 17), Trinity Church, and the Staten Island Ferry Terminal. The City Hall unit is a personal favorite with its varied and representative sampling of large skyscrapers, detailed smaller buildings, and foliage; as is the Brookfield Place unit with its off-grid geometry, interesting architecture, and detailed harbor. I hope you will be able to derive as much enjoyment from these models as I’ve had in designing them. To give you a clearer idea of the next units, we here present you with some further renderings. LEGO® is a trademark of the LEGO® Group of companies which does not sponsor, authorize or endorse this project. Two years ago I would have said: "There will be no problems at all". Today I'm more experienced and I know very well how difficult it has been to find a supplier for our bricks in the needed quantities and quality. 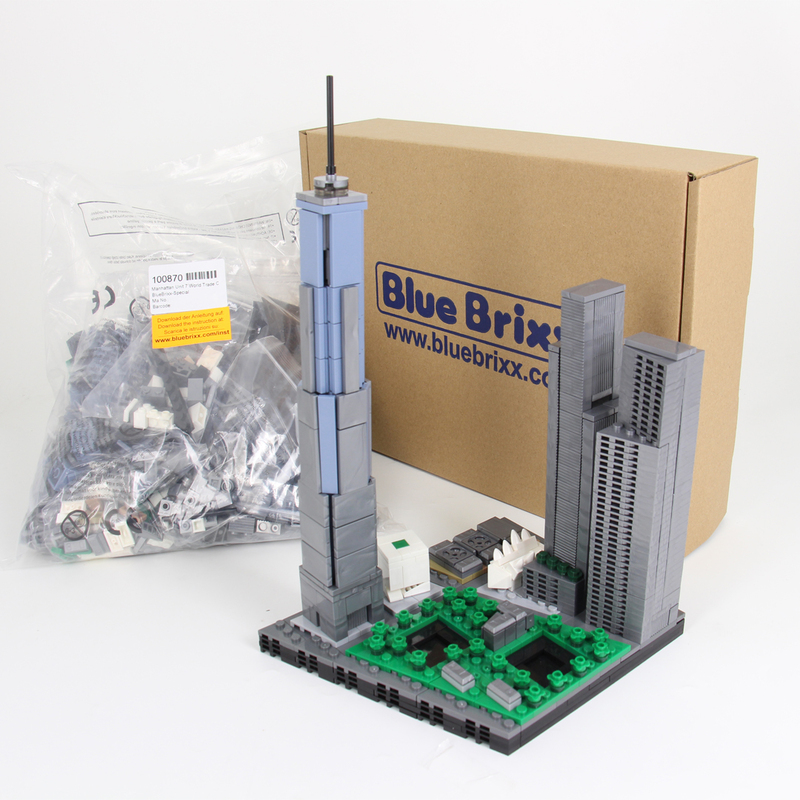 But I also know that we have now solved this difficulty with our supplier for the bricks of our existing BlueBrixx models. We have experienced issues concerning such things as delivery times, possible mistakes in the ordering process due to the huge number of different elements we need, and other small difficulties. Of course, it could be that some new problem will arise to create a delay. But in the past we have solved all such problems, and in addition to that experience we have also built some room into our delivery schedule so that a small delay with our supplier, for example, will not result in any delay for your delivery. In each case, we will keep you updated all the time.